As we enter the month of August 2015, the spirit of commemoration to celebrate our nation Golden Jubilee birthday are high. At Oscar's, the team has prepared a sumptuous spread of local delights such as Chilli Crab, Crispy Fried Squid with Salted Egg, Oyster Omelette and Oscar's Signature Homemade Waffles in patriotic red. Meanwhile, the main attraction is none other than SG50 theme Lapis. The layer alternated between Red and White, with a unique “Bandung” Flavoured available in the buffet section of Oscar's. 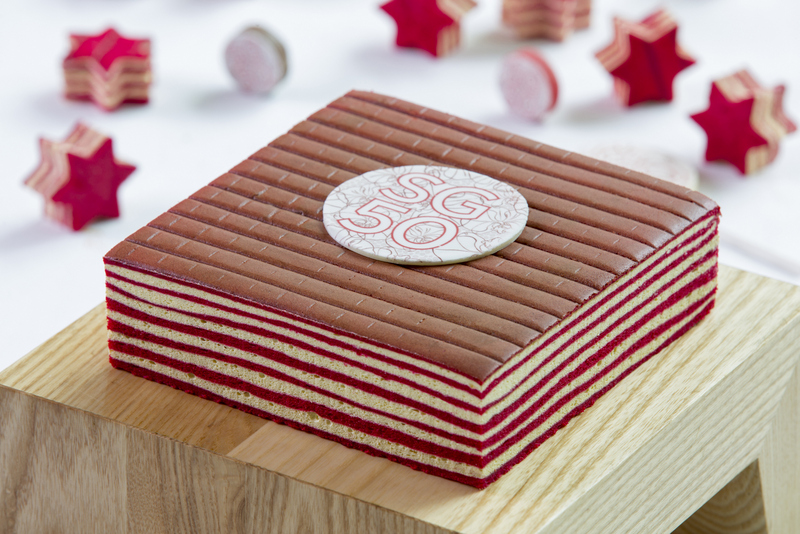 If you want to purchase this SG50 Lapis only, it is available at The Terrace at $75 nett for 1 kg size. On top of the local dishes and SG50 dishes, the regular attractions such as Crustacean Stations: (the famous Oyster bar); Salad Station, Sushi Stations, International Stations and Dessert Corners are available for you to savour. Quote “Ice Kacang” to enjoy SG50 Buffet Dinner at S$50++ per adult, S$25++ per child on Monday to Wednesday. Diners of 60 years and above enjoy 50% off regular price buffet lunch and dinner, except on eve and public holidays. SG50 promotion is available until 31 August 2015.